Especially since today is his birthday. Nick Lowe is The Man. Check out this live video of his song "So It Goes" (with Rockpile) if you need proof. Gentleman Jesse and his Men from the ATL appropriated the guitar riff to amazing results. Check them out if they ever come to your town. One of my favorite things about my current job is getting to pick cover images for C&RL News. While I have broken the usual trend and commissioned original artwork, most of the covers are from archives and exhibits that are sent in from various libraries. Today I received some pictures and a link to an online collection of excellent photographs from a North Carolina photographer named Hugh Morton. The UNC Chapel Hill Libraries acquired his archives and are documenting the collection on a blog called A View to Hugh. In addition to posting selected images and commentary, the blog includes some behind the scenes looks at the processing of the collection. And it won a 2008 Best Archives on the Web award. Very cool! This morning my handy Life In Hell calendar and Facebook informed me that my friend Griffey shares a birthday w/ soul legend Wilson Pickett. I couldn't find video of Griffey singing karaoke or anything, so please enjoy this ferocious live version of "Mustang Sally." I dare you to not shake what the good Lord gave ya in your cube/ office. As you probably heard, there were some crazy bad tornadoes over the weekend in Atlanta. There was a lot of destruction in downtown and the path moved very close or through several areas of town where I used to live or spend a lot of time or had friends live. Scary! 1. Google Map tracking the path of the storms. It has notes about various damaged locations and everything. 2. Flickr set of damage in East Atlanta, the last neighborhood I lived in before moving. Very cool use of technology to document a disaster in an immediate way. As far as I know, all of my ATL peeps are fine, and perhaps even have power now. I usually don't document the obscure song references, but the title of this post is a song by an amazing Florida singer/songwriter named Jim White. Here's a video of him singing it on Swedish television. And for some ATL flavor, here's Jim performing his song "Alabama Chrome" at Criminal Records. I used to spend too much money there. A prize to the first commenter who correctly identifies what "Alabama chrome" refers to. Unfortunately, I think it is going to take more than Alabama chrome to fix the damage in Atlanta. Take care down there, everyone. Oh hi, you're still here? Don't you have anything better to do? No? Ok, I'll try to start posting regularly again. I've been getting more and more interested in graphic design since I started working in publishing. I've always been fascinated by signage and things like that, but I've really started becoming more actively interested in the theory behind design from a marketing and aesthetic perspective. So much so that I've started seeking out books by Edward Tufte, despite his hated of PowerPoint. Which is not inherently evil. As part of this newfound interest, I recently Netflixed a great movie called "Helvetica." I meant to check it out when it screened a couple of times in Chicago, but never got around to it. Yeah, yeah. A movie about a font. But it really is an interesting overview of modern and postmodern graphic design. And how both designers and consumers, for lack of a better word, react to visuals, especially the presentation of the written word. I'm a pretty huge fan of helvetica the font. Despite it's ubiquity, I'm a big fan ofthe modern look and the clean lines, and use it as my standard presentation font. The film does a great job of outlining the history and development of helvetica from the Swiss school of design to becoming a major corporate style in U.S. advertising and marketing. The anti-corporate reactions to helvetica are pretty interesting, with one designer semi-jokingly saying that it was responsible for the Vietnam War. These reactions, along with the influence of drug and music culture on the design world, influenced a move to more freeform, hand drawn typeface and design. And eventually to so-called "grunge" design, typified by Raygun Magazine. I always had a love/ hate relationship with Raygun. Copies would show up in the mail when I worked in a library periodicals department, despite us not having a subscription, and would usually find its way home with me. The unreadability sometimes drove me nuts, even if it did look cool. In "Helvetica," the editor of Raygun tells a hilarious story about receiving a very cliche, and not very good, article about Brian Ferry (which probably mentioned repeatedly how suave he is and that "Avalon" is a great album), and running it completely in wingdings to make a point about the disposable quality of the writing. But since all things are cyclical, reaction to the over-the-top nature of the more cluttered style led to a return to the helvetica-based, cleaner design done best by the super cool Dutch firm Experimental Jetset. Anyway, check out "Helvetica" the film if you are remotely interested in graphic design or good documentary film making in general. There are some bands I like to name check, and one of them is Pavement. But I've never been a huge fan of Stephen Malkmus solo for some reason. So I'm pleasantly surprised that I'm digging his new album "Real Emotional Trash." Nice random lyrics and delivery backed by some interesting languid, jazzy stoner rock. Good guitar solos too. And one section of the title track has a definite "LA Woman" vibe. Not too shabby. This week's consumable is sushi. Tasty, tasty sushi. 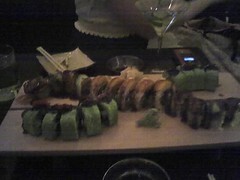 On Saturday evening I went to a great sushi place called Tank in Lincoln Square. They do sushi the arty way, with interesting ingredients, flavor combinations, and presentation (follow the Flickr link for specifics). I think I still enjoy Tanoshii better for high end sushi goodness, but Tank is worth trip. And the perfect start to a square dance evening in excellent company.